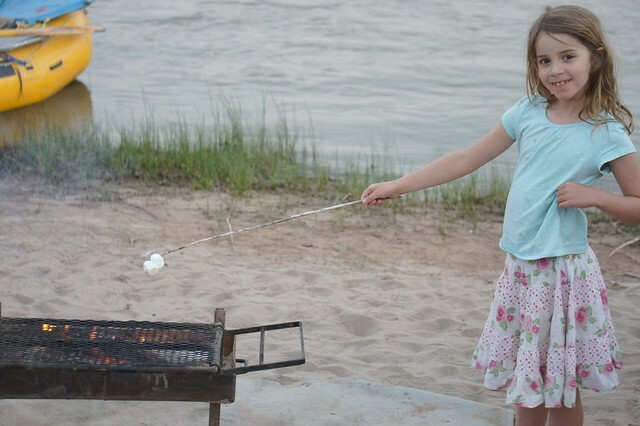 I have done some white water rafting in my time, but was very seduced by the idea of taking my daughter rafting and then camping on a river beach and toasting marshmallows over a fire. A little contrived, perhaps, but that is what clichés are there for! 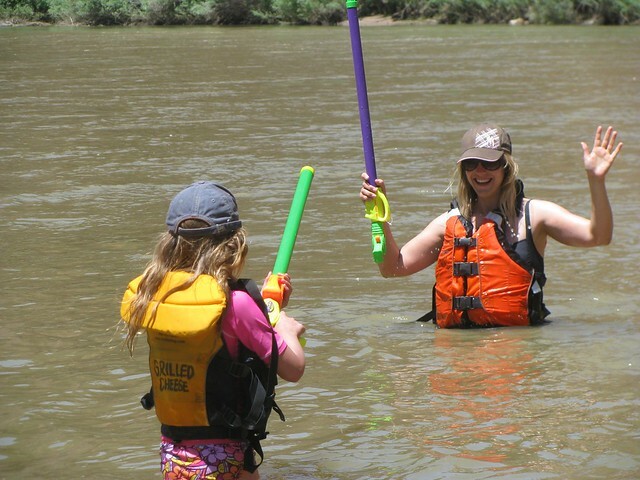 Because my daughter is only seven, I was unable to take her on fast rapids – you need to be 10 and over for that – so we settled for a two day, one night ‘float trip’ on the Colorado River, with a few light rapids along the way. We were given the option at the time of booking whether we wanted an inflatable kayak, or to go on the oarboat with our guide. We opted for a kayak, with the agreement that if we got tired, we could have a lift. And what a good choice that was! 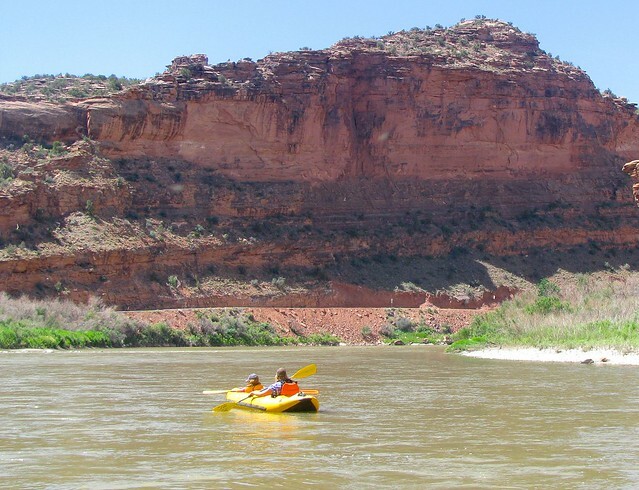 We set off on our adventure, kayaking down some of the most gorgeous scenery. 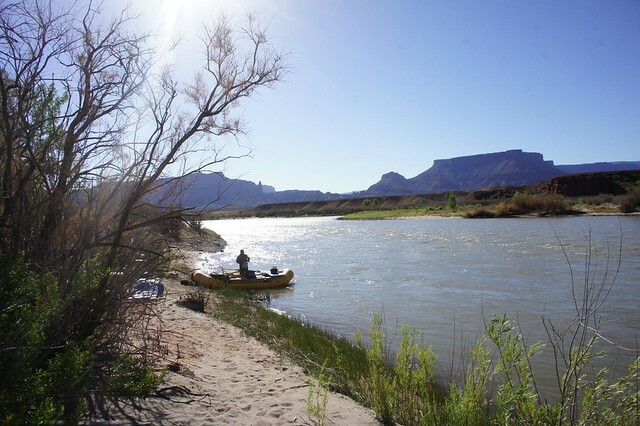 The red rocks and clear blue skies had quite rightly earned our section of the river the moniker of ‘postcard alley.’ Our lunch was a sumptuous affair on a deserted beach. We went to look for interesting stones and explored our tiny island while our guide prepared some delicious food. The pace was perfect for us, enough time to potter around, but not so much time that we got restless. After lunch, we headed off again, stopping off for swims and waterfights along the way in the surprisingly warm water. We eventually found a beach that was perfect for camping, so we pitched our tent and looked for lizards while our guide prepared our dinner. I didn’t have to lift a finger. As the stars started to come out, I sat back and was quite simply in awe of the scenery. We felt so far from civilisation, it was a real treat to have left mobiles behind and to just enjoy some of life’s simple pleasures. My daughter loved the beach and the surroundings and was as happy as Larry, I even had time to open my book and read a little. Our guide didn’t just have us toasting marshmallows, but introduced us to smores, a traditional American campfire treat of marshmallow, chocolate and crackers….